Spring is here! 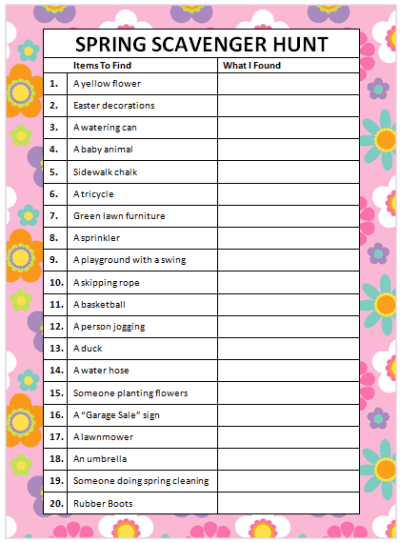 Flower are starting to bloom & it’s a great time to be enjoying outdoor activities like this free printable Spring Scavenger Hunt game. You can print this & take it along with you & your kids for a walk through your neighborhood. Have your kids point out their findings or use a kid-friendly digital camera to take pictures. Scavenger hunt games are so easy to play because all you need is a free printable game! They are a fun way to discover new and exciting things in your own neighborhood. Your children can even make up their own games by thinking of a list of items they want to find outside. They can come up with some pretty wild answers! What are your favorite things about spring? Did they make it onto this list? We have loads of free printable games to share with you. Head over to our Free Printable Games page to see all the different types like charades, scavenger hunts, word searches, BINGO cards and more! We add new content several times a week. To stay updated on the latest ideas for family fun, follow along on Facebook, Twitter, Pinterest or our new RSS feed Bloglovin’. We look forward to welcoming you to our community! What are your favorite spring time activities? Riding your bike? Planting flowers? Spring cleaning? Let us know in the comments below.